Today’s fast moving global business community relies on a highly sophisticated human resource organization to drive change in all areas of human capital. More than ever, executive management is recognizing that the human resource organization plays a vital role in the financial success of the company. One has to go beyond reducing top-line costs and delve into the business implications of HR data and processes that can create a more strategic HR organization. Thus comes the strategic choice of HR Partnering. HR Partnering (HRP) is the newest, most exciting trend in both the Human Resources Outsourcing (HRO) industry, and the quickly expanding Business Process Outsourcing (BPO) industry. Historically, organizations have been fearful of outsourcing “mission-critical” activities. They have limited the relationship to less strategic and more transactional activities. However, there has been a significant shift in this mindset over the past few years. This is where Pro-Staffers LLC has stepped in with HRP. This is a descriptive report on Pro-staffers LLC that mention its different activities. Now it is the era of Business & Technology. To keep pace with the Education system has become more and more practical and as a result practical knowledge has got priority. To provide fresh graduates with professional knowledge related to the academic training, University of Dhaka, which is conducting Masters of Business Administration (MBA) in Human Resource Management (HRM). The course contains indispensable practical orientation in different organizations as a part of the MBA Program. Under this course the students are sent to gather practical knowledge about organizational environment and activities. This report has been prepared on practical orientation has been originated on above thinking. As I have just completed my MBA program under the stream of HRM so I have worked on my interested business sector under private organization and my projection was made on a staffing and HR consulting organization i.e., Pro-Staffers LLC. To observe and study various desk works of the organization. To examine the various activities relating to the staffing process. To identify practically how the organization readjust their activities with newly recruited employees. Sources of information: I have completed my internship report by collecting information from both primary and secondary sources. There is informal conversation with the clients. Practical work exposures form the different desks of the organization. Secondary sources: For completing this report fruitfully I have read various books, articles, and company’s brosure and so on. Secondary information was collected from following ways. Various books, articles, compilations etc. Various books regarding staffing and related issues. Pro-staffers LLC is a new organization in our country. It is providing state of the art staffing solutions to client companies striving on client’s core business success. It believes in placing the right talent for the right job, not just the talent. The report covers the organizational structure, background, functions and the performance of the organization. The scope of the study is just to acquaint with the operational scenario of the organization. For the bindings of security all the data could not be enclosed in this report. Lack of experiences has acted as constraints in the way of meticulous exploration on the topic. Very limited information is available regarding the organization. The internship time period is not enough for completing such a report. But Pro-staffers LLC is different and better in many ways. First, recruiting is a science not everyone can learn this like Martial Art. It has learned and mastered this process by a long and rigorous training and application process. Understanding the client company requirements is another beast all together, this is not just publishing generic requirements in the news paper and resumes will pour in but understanding and analyzing the process behind the open position is also something the clients have to know very well to define the position requirements. Again it is masters in this process as well. Well, it also provides 30 days money back guarantee and 90 days replacement warranty which the clients will seldom find. It makes the whole process of recruiting for the client company a win-win situation. The objective of an organization is a very important part for its business. Objective must be “SMART” where S stands for Specific, M for Measurable, A for Achievable, R for Realistic and T for Time-based. The objectives of Pro-staffers LLC are- “C2, we are customer centric. Win-win approach for the customer is the way we do business. State of the art staffing and technology consulting solutions provider. Business process reengineering and rightsizing consulting. ± Business Process Re-engineering & Rightsizing Consulting: Business Process Reengineering is a scientific process, which enables the company to systematically optimize functionalities, time and cost, the net result is cost minimizing and maximizing company profit. Pro-staffers LLC do the reengineering by signing an contract with the client company, assign a consultant analyst to evaluate and analyze your on going business process, HR practices, job and functions analysis, SWOT, cost–benefit analysis and other relevant diagnosis recommending appropriate process solutions to make necessary modification to your company’s current process that will optimize and reduce cost of doing business resulting profit maximization. ± Pro-staffers LLC provide pragmatic HRM & Technology planning consulting on the clients’ core business process requirements. It ensures cutting –edge technology & scientific staffing through optimum re-engineering and rightsizing employees of Client Company’s business environment. It is flexible to enjoy a sustained efficient working environment in the organization by minimizing cost and maximizing profit. v Basic Technology Understanding etc. for entry to management level. Pro-staffers LLC also provide motivational sessions for new and old employees of Client Company to boost up the employees efficiency and moral enabling to enhance employee productivity. Pro-CRM is a commercial CRM solution that helps enterprise businesses to manage customer relationships in a highly organized and efficient way. In today’s competitive market, it is essential to build and sustain relationship with customers, while keeping costs low, but delivering results better than ever before. Pro-CRM solution is feature-rich software that seamlessly integrates all aspects of customer life cycle from identifying business opportunities to sustaining existing customers. With this Pro-CRM solution, the customers can automate everyday tasks, catch mission-critical & time-sensitive issues and stay on top of big opportunities. Employee hired under Customer’s payroll through Pro-Staffers is 1 (one) month cost of the employee. In an unlikely event where the customer company finds within 30 days that the employee we provide is not the exact fit, relax, we will refund the service charge guaranteed. Just make sure you claim the 30D-MBG within 30 days of hire. Local clients: Pro-staffers LLC has many local clients for whom it collects resume and sends the best candidates as their requirement. The local clients of pro-staffers are given to the following in tabular format. Pro-Staffers LLC a Staffing solutions & IT consulting service provider where people, Process and Technology converge in harmony. Pro-Staffers mission is to use people, process and technology together to make organizations work effectively and gain competitive advantages. Expert Solutions tailored to meet clients’ unique business needs. Converging people, process and technology in harmony means resolving technology challenges with a holistic approach. Each client Pro-staffers LLC will work with shall have different business objectives, constraints, and resources availability. That’s why it offers both Consulting and Staffing Solutions that it tailor to meet clients’ unique business needs. To find out the right combination of people, process and technology is the biggest challenge facing today’s fast paced changing business environments. That’s why Pro-staffers LLC offer a unique combination of IT consulting and staffing solutions to help the clients’ business organization succeed. Pro-staffers LLC’s Technology Consulting Solution Professionals provides programming and systems engineering solutions for web-based applications. Using the latest tools and techniques, Pro-Staffers Consulting Solutions can deliver clear, measurable, effective, and high-powered solutions to your Technology challenges. Web-Based Application Design and Development – Specializing in three-tier (web browser/server, application/business logic server, and DB server) applications, Pro-staffers LLC develop custom applications that help the clients run their organization more effectively. It designs web front-ends to database applications which reduce systems management costs and make new systems easier to use. By using existing data systems to drive new applications, it ensures seamless integration between new and existing systems whether they are within or outside the network. Application Troubleshooting and Feature Enhancement – Pro-staffers LLC can fix and upgrade applications and websites that crash frequently, run too slowly or need new functionality. For performance problems, it diagnoses the root cause (usually hardware or architecture) then fixes the problem itself or gives recommendations to the clients’ IT staff. Pro-staffers LLC offer complete outsourced development as well as consulting services. Training is included in both service delivery models, so, regardless of how the work is performed, clients staff and end users will be up and running as soon as its project is completed. Outsourced Development – Pro-Staffers project professionals assumes full responsibility for completion of project; billed as a flat-fee based on detailed project requirements; work typically performed in-house and on request offsite services can be provided. Consulting Engagements – Pro-Staffers consultants with a specific expertise provide strategic planning, short-term project management/support, or part-time maintenance; billed at an hourly rate; work performed onsite or offsite. The Pro-Staffers Staffing Solution Professionals provide placement services for technical as well as non-technical positions from entry to top management level. It offers services to both employers looking to fill vacancies or add new talents and job candidates looking for a change. Streamlining the hiring process saves time and money. Professional recruiters do the time consuming legwork for you. They search through hundreds of resumes to present you with a handful of the most qualified applicants. They pre-screen dozens of applicants so you interview only the very best. They schedule interviews, check references, negotiate employment terms, and complete legal paperwork. Access to broader talent pool. Professional recruiters are professional net workers. The good ones have access to far more prospective employees than can be found on the job boards or through advertising. The best candidates are too busy at their current jobs to respond to ads or post their resumes online. These passive job seekers are found through proprietary databases and word-of-mouth by professional recruiters. Pro-staffers LLC work countrywide and across industries to source candidates for positions from entry level to boardroom and everything in between. Permanent Placement – Pro-Staffers Staffing Solutions finds and presents candidates for full time employment with our client; fee paid only when client hires a candidate we present. Temporary-to-Permanent Placement – Pro-Staffers contractual employee placed onsite for set period of time then hired by our client as an employee (often at the completion of a project). Contractual Employment – Pro-Staffers contractor placed onsite to augment team. Free and Confidential Resume Submission – Whether the job seekers are actively searching for a job or just interested in “testing the waters,” they are requested to submit their resume and a Staffing specialist will contact them.. This service is absolutely free to the job seekers. In the market place thousands of people are looking for jobs and simultaneously hundreds of companies are seeking for right employees. Pro-staffers LLC’s core service is to find the right talent for the right position that narrows the gap. It believes that every candidate/employee has a unique quality to be perfectly fit for a suitable job position; it developed set of scientific profiling system to analyze clients’ employee requirements and establish the employee profile, then out of thousand of resumes from the resume bank it interviews handful and identify few who fits that profile. Its approach to the staffing process ensures the clients’ quickly get the right fit for the right job. It follows some crucial steps to recruit the employees for the clients’ organization. The lifecycle of a requirement is given to the following step by step. Understanding of clients requirements: When any offer comes to the pro-staffers from its clients it firstly tries to understand the offer. It carefully scrutinizes every part of the offer and understands the requirements of the clients in detail. It hardly tries to find out the answer of the following questions from the clients’ offer. What types of employees are needed for the clients’ organization? How many employees are needed for the organization? What are the basic conditions of the offer? What is their payment system? How many amounts they are ready to provide pro-staffers? What is the time-frame of the recruitment? And so on. In-house resume bank: Pro-staffers LLC maintains a resume bank. It collects resume from the candidates who are interested to find out jobs through pro-staffers. From this resume bank it searches resume for the clients’ organization. From bdjobs site: Pro-staffers LLC has made an agreement with bdjobs to collect resume whenever it needs. So if it does not find suitable resume from its resume bank as the requirement then it search resume from bdjobs site. Head hunt: Some-time the clients offer pro-staffers to collect specific employees who are working another organization for their own organization. Then pro-staffers communicates that persons and inform about the offer. This way pro-staffers also provide employees to its clients. This process is called Head hunt process. In management it is called Job hopping. Put advertisement: If Pro-staffers LLC does not able to collect resume as the requirement of the clients through the above three steps it puts advertisement to the newspaper or other web-based job sites. In the advertisement it provides all the necessary information and invites the suitable and interested employees. Make candidates shortlist (Select Resume): After searching the resume from the above sources as the clients’ requirement pro-staffers make a candidates shortlist. It selects the best candidates among the candidate’s pool for the clients. Call candidates for interview schedule: Pro-staffers communicate with the candidates who are selected and ask them for having an interview. If the candidates agree to face interview it fixes a schedule and arranges an interview program. But if the selected candidates do not able to face interview for any reason then it selects another candidates for the clients as their requirement. Here one thing is needed to mention that Pro-staffers LLC only selects those candidates who are always ready to face interview whenever is called. Collecting detail resume: The candidates are selected for having interview pro-staffers call them to come along with their detail resume. Pro-staffers generally maintains a resume bank but whenever any interview is called it collects then the full (detail) resume from the candidates. The detail resume is collected in a word format way. Preliminary reception: The organization selects employees and the applicants select employers. Simply put, the selection process is a two way street. Here, a preliminary interview is granted as a courtesy and then the applicant appears in person. It also helps pro-staffers screen out obvious misfits and get information on these selected applicants. Psychological test: This test measures personality or temperament. They are among the least reliable tests. Validity suffers because the relationship between personality and performance is often vague or nonexistence. Knowledge test: This test is more reliable because it determines information or knowledge. Performance test: Performance test measures the ability of applicants to do some parts of the work for which they are to be hired. Validity is often assumed when the test includes a representative sample of the work the applicants are to do upon being hired. Attitude and honesty test: These tests are being used in some circumstances to learn about the attitudes of applicants and employees toward a variety of job related subjects. Can the applicants do the job? Selection interviews are the most widely used selection technique. Selection interview may be conducted of one to one basis or group basis. In one to one basis a job applicant is interviewed by one interviewer. In group basis one interviewee may be interviewed by a group of interviewers or a group of interviewees may be interviewed by a single interviewer or a group of interviewers may be interviewed by a group of interviewers. Unstructured interviews: An unstructured interview allows employment specialists to develop questions as the interview proceeds. The interviewer goes into topic areas they arise, trying to simulate a friendly conversation. Structured interviews: Structured or directive interviews rely on a predetermined set of questions. 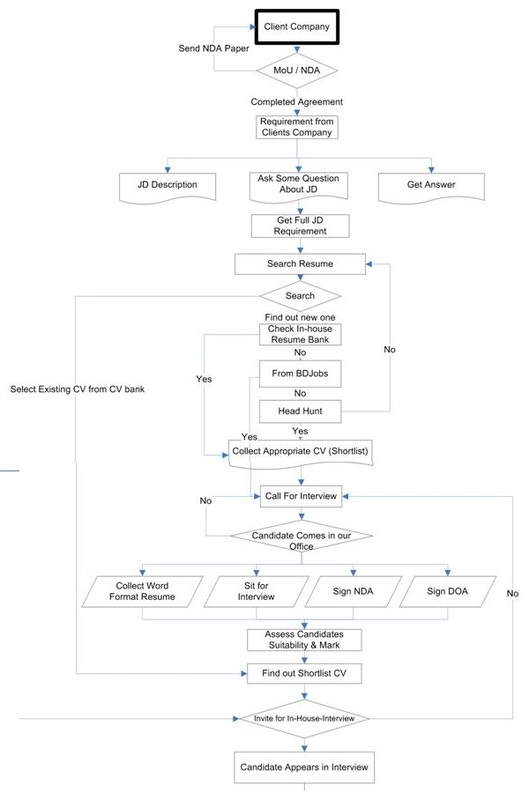 The questions are developed before the interview begins and are asked of every applicant, as in the computerized approach. Structured questions improve the reliability of the interview process but do not allow the interviewer to follow up on interesting or unusual responses. This process seems quite mechanical to all concerned. Mixed interviews: Here interviewers typically use a blend of structured and unstructured questions. The structured questions provide a base of information that allows comparisons between candidates; the unstructured questions make the interview more conversational and permit greater insights into the unique differences between applicants. Behavioral interviews: Behavioral interviewing focuses on a problem or a hypothetical situation that the applicant is asked to solve. Often these are hypothetical situations and the applicant is asked what should be done. Both the answer and approach are evaluated. This interview technique has a very narrow scope. It preliminary reveals the applicants ability to solve the types of problems presented. Validity is more likely if the hypothetical situations match those found on the job. Stress interviews: This type of interviews attempt to learn how the applicants will respond to job pressure. These interviews have useful applications in civilian employment. Here the applicants are sometimes put through a stress interview to see how they might react to problems encountered in the street. The interview consists of a series of harsh questions asked in rapid-fire succession and in an unfriendly manner. This technique is used in connection with other interview format. Interviewer preparation: The interviewer firstly reviews the application and job description information to prepare specific questions before beginning the interview. Answers of these questions determine the applicant’s suitability. Since interviews help persuade top applicants to accept subsequent job offers, interviewers need to be able to explain job duties, performance standards, pay, benefits and other areas of interest. Creation of rapport: When the interviewee becomes nervous in the interview board the interviewers make the situation easier for him by asking simple questions. Information exchange: The interview process is a conversation in which information is exchanged. To help establish rapport while learning about the candidate, some interviewers begin by asking the interviewee if he or she has any questions. This establishes two-way communication and allows the interviewer to begin judging the recruit by the types of questions asked. Termination: As the list of questions dwindles or the available time ends, the interviewer draws the session close. Here nonverbal communication is used. Sitting erect, turning toward the door, glancing at watch or clock all tell the applicant that the end is near. Sometime interviewers terminate the interview by asking, do you have any final questions? Evaluation: Immediately after the interview ends, the interviewers record specific answers by and general impressions about the candidate. Finally the interviewers evaluate the performance of the applicants and on the basis of the evaluation the best applicants are selected for the clients’ organization. Is the applicant a good, reliable worker? Are the job accomplishments, titles, educational background and other facts on the resume or application true? What type of person is the applicant? Most important, what information is relevant to matching the applicant and the job? To answer these questions, Pro-staffers LLC uses references and background checks. It may even supplement the application from with biographical information blank that goes beyond the one in the typical application. Entitle the employer to lower health or life insurance rates for company paid insurance. Be required by state or local health officials, particularly in food-handling operations where communicable diseases are a danger. Be useful to evaluate whether the applicant can handle the physical or mental stress of a job. Pro-staffers LLC only complete this step when the clients ask to do this otherwise it is done by the company itself. When the clients’ organizations want a medical evaluation, it is increasingly scheduled after the hiring decision. Supervisory interview: The ultimate responsibility for a newly hired worker’s success falls to the worker’s immediate supervisor. The supervisor is often able to evaluate the applicant’s technical abilities. Likewise, the immediate supervisor can often answer the interviewee’s specific job related questions with precision. When supervisors make the final decision, the employment function provides supervisor with the best prescreened applicants available. From those two or three applicants the supervisor decides whom to hire. Actually this crucial step is not done by pro-staffers but the clients want to do, it is completed by them. Realistic job preview: Realistic job previews supplement the supervisory interview. It shows the employee the job and the job setting before the hiring decision is made. This part is also completed by the clients’ company. Hiring decision: It is the final step of a selection process. Hiring decision is only taken by the company. The hiring process involves more than just extending an offer. To maintain good public relations, employers generally notify applicants who were not selected. We agree to offer to each other a legally binding Agreement that all information relating to each of us will be kept confidential by the other. We or our representatives (“the discloser”) may need to disclose to the other (“the recipient”) information relating to each other’s financial and commercial activities. In order to protect our interests in the information we each disclose, we wish to set out the terms and conditions on which the information is disclosed. For the purpose of this Agreement, “Confidential Information” means all confidential information disclosed by the discloser to the recipient and shall include (but not be limited to) the business dealings and affairs and prospective business and affairs of the discloser, the technology underlying the concepts, products and services and prospective concepts, products and services, product, financial, marketing, manufacturing, organizational, technical and other data relating to the discloser, the finances, price lists and identity of customers, suppliers, agents, distributors and contractors of the discloser and shall comprise not only written information, but also information transferred orally, visually, electronically or by other means whether or not it is expressly stated to be confidential. (v)The recipient can show was made available to it by a third party who had not imposed on the recipient any subsisting obligation of confidentiality or restricted use in respect thereof. The signatories to this agreement acknowledge that no effort shall be made to circumvent its terms either individually or severally as an attempt to gain commissions, fees, remuneration, or considerations to the benefit of any of the signatories of this Agreement their partners or associates. Any controversy or claim arising out of or relating to this Agreement, or breach thereof, and which is not settled between the signatories themselves, shall be settled by arbitration in accordance with the rules of the American Arbitration Association, with hearings to take place in Traverse City, Michigan or another mutually agreed upon location. This Agreement shall be for three (3) years from the date affixed below and shall apply to any and all transactions entertained by the parties hereto, relating to the subject matter on paragraph 1, including subsequent follow-up, repeat, extended or renegotiated transactions, as well as to the original transactions. Recipient agrees not to disclose confidential information for a period of three (3) years from the date of the receipt of the confidential information. This document shall in no way be constructed as being an Agreement of partnership and no signatory shall be liable for the other signatory’s commitments or liabilities in business or personal dealings or situation. All terms and conditions are mutually reciprocating to both parties. Essentially, the spirit behind this Agreement is one of mutual trust and confidence and of the reliance upon each other to do what is fair and equitable. LUTFOR RAHMAN of 121Aagasadek road, 2nd floor, Dhaka-1000 herein after referred to as the 2nd party in this agreement. Signed as on the LUTFOR RAHMAN of our Common Era, and hereinafter binding on both parties with immediate effect upon signature of the Agreement. LUTFOR RAHMAN hereby allows Pro-Staffers LLC to submit his/hers résumé and credentials to any prospective Employers they see fit for a better employment opportunity. The main objective is to protect mutual interest of both the parties, so that both the parties are not financially looser. That includes when LUTFOR RAHMAN is been called for interview with the client company, LUTFOR RAHMAN shall abstain from telling salary expectation if asked. LUTFOR RAHMAN will refer Pro- Staffers LLC to negotiate his/hers salary with the client company. This agreement is made effective as of the date it is executed by both the parties and is between LUTFOR RAHMAN of 121 Aagasadek road, 2nd floor, Dhaka-1000 and Pro Staffers LLC, situated at Suite # 5W, OverseasCenter, Building # 19-20, Road # 113/A, GulshanHeights, Dhaka-1212, Bangladesh. This agreement sets forth the business arrangements between the two parties. This Agreement incorporates the confidentiality agreement between Pro-Staffers LLC and LUTFOR RAHMAN of 121 Agasadek road, 2nd floor, Dhaka-1000. This agreement will be valid for 90 days from the date of joining of LUTFOR RAHMAN to any company, whatsoever arranged / provided by Pro Staffers LLC. Within 90 days from the date of his joining, LUTFOR RAHMAN cannot join any other company. After 90 days from the date of joining of LUTFOR RAHMAN to any company provided by Pro-Staffers LLC , this agreement will be automatically terminated or come to an end from both the parties. Any controversy or claim arising out of or relating to this Agreement, or breach thereof, and which is not settled between the 1st Party and 2nd Party themselves, shall be settled by arbitration. Both parties agree that in the event of a dispute, a mutual resolution must be found, and everyone agrees to work in good faith to find a resolution. Both parties agree that if any dispute can not be settled by the two parties (1st Party and 2nd Party), then a 3rd party of both parties agreed to, will arbitrate the dispute like out of court settlement, to avoid judicial proceedings and agree not to bring litigation one to the other further. Pro Staffers LLC will be dedicated for providing Staffing Solutions to any suitable company for the candidate and maintain his/her confidentiality strictly. Pro Staffers LLC will deal with all the formalities, documentation, arranging interviews for LUTFOR RAHMAN placing him to clients organization for final interview, submit invoice and collecting service charges if he is hired successfully by the company arranged by Pro Staffers LLC. The candidates / employees supplied by Pro Staffers LLC for interviews to any company, if those candidate(s) are not selected by the client company, then the client company can not hire them within 12 months (365 days) from the date of candidate(s) rejection and vice versa i.e. the candidate who is rejected cannot join that client company within 12 months (365 days). Pro – Staffers LLC cannot claim any service charges from LUTFOR RAHMAN for providing him with a suitable job in any company. Its free of cost services to LUTFOR RAHMAN with view to help employees get the right job. Pro Staffers LLC will not at all be obligated at any means to provide LUTFOR RAHMAN if Pro – Staffers LLC does not find a suitable job for him. Precisely, no charges from the candidate for providing job and no obligations to Pro Staffers LLC from candidate who does not get a job. Hide candidates’ personal information. This is done only for caution that the organizations do not able to communicate with the candidates personally. Prepare resume in pdf format with Pro-staffers LLC name, address and logo. This is done only for that the organizations do not able to change any information or any word of the resume. After the client end interview Pro-staffers LLC takes comments from the clients as well as from the candidates about the interview program. If clients chose candidates it takes appointment letter from them and send the letter to the candidates. If not choose pro-staffers again follow the steps from 2 or 3. “X” company (Bangladesh) Ltd., 75, Suhrawardi Ave., Block-K, Baridhara, Dhaka-1212 Bangladesh, hereinafter referred to as the 2nd Party in this agreement. Signed as on the (Signing date) 2007 of our Common Era, and hereinafter binding on both parties with immediate effect upon signature of the Agreement. The main objective is to provide exact fit(s) for the staffing requirement(s) of “X” company (Bangladesh) Ltd., and gain the satisfaction of the customer by Pro-Staffers LLC, an established, offshore, Bangladesh based Staffing and IS (Information System) consulting services provider. This agreement is made effective as of the date it is executed by both the parties and is between “X” company (Bangladesh) Ltd., with its office at 75, Suhrawardi Ave., Block-K, Baridhara, Dhaka-1212, Bangladesh and Pro-Staffers LLC, situated at Suite #5W, Overseas Center, Building 19-20, Road 113/A, Gulshan Heights, Dhak-1212, Bangladesh. This Agreement sets forth the business arrangements between the two parties. This Agreement also incorporates the confidentiality agreement between Pro-Staffers LLC and “X” company (Bangladesh) Ltd. This agreement will be valid for 1 year (365 days) from the date of signing the agreement and will be automatically extended for each year, unless either party informs the other to the contrary in writing. Signing the NDA (Mutual Non-Disclosure / Non-Circumvent Agreement) is also a part of this agreement. If either party wishes to terminate the agreement, it must give other party thirty days notice in writing, and both parties agree to collaborate on a tranquil separation, with settlement of outstanding fees. No reasons need to be given. “X” company (Bangladesh) Ltd. will submit written staff requisition in full details (position, approximate salary range/ regular or contractual employee/ project basis employee etc.) to Pro-Staffers LLC as per their current and /or future need. Pro-Staffers LLC will be dedicated for providing the exact fit (s) of the staffing requirement and / or IS consulting services to “X” company (Bangladesh) Ltd. with the best possible candidate available in the market. Pro-Staffers LLC will deal with all the formalities, documentation, arranging interviews for the right candidate, placing candidate to clients organization, submit invoice and collecting service charges, settling issues between two parties, ensuring 30 days Money Back Guarantee and 90 Days free replacement warranty etc. The candidates / employees supplied by Pro-Staffers LLC for interviews to “X” company (Bangladesh) Ltd., if those candidate(s) are not selected by “X” company (Bangladesh) Ltd., then “X” company (Bangladesh) Ltd. can not hire them within 24 months (730 days) from the date of candidate(s) rejection. If “X” company (Bangladesh) Ltd. hires the same rejected candidate(s) within the aforesaid time period without Pro-Staffers’ LLC’s knowledge then “X” company (Bangladesh) Ltd. will be obligated to pay the full service charges as per this agreement to Pro Staffers LLC. Nevertheless, “X” company (Bangladesh) Ltd. can always contract other HR Outsourcing service providers and/or contact any suitable candidate by themselves apart from the candidates selected and provided by Pro-Staffers LLC because this is a non-exclusive contract between both Pro-Staffers LLC and “X” company (Bangladesh) Ltd.
Pro-Staffers LLC will not pro-actively solicit or offer employment opportunities to “X” company (Bangladesh) Ltd. employees for the duration of this contract. However, should any “X” company (Bangladesh) Ltd. employee(s) voluntarily respond to any Pro-Staffers job posting where ever either on any electronic and paper media and or word of mouth and through the patented screening process if someone is selected by the client company who happens to be an “X” company (Bangladesh) Ltd. employee, in this scenario it’s totally legal on Pro-Staffers LLC to offer an exact fit candidate who may happen to be an employee of “X” company (Bangladesh) Ltd. to a client company. In an unlikely event where “X” company (Bangladesh) Ltd. finds within 30 days that the employee Pro-Staffers LLC provided is not an exact fit, Pro-Staffers LLC will refund the service charges, guaranteed, but “X” company (Bangladesh) Ltd. must claim the 30D-MBG within 30 days of hiring. After 30 days of hiring, 30D-MBG is not valid. Pro Staffers LLC also offer 90 days replacement warranty regardless of whether the employee resigns or the employment is terminated by “X” company (Bangladesh) Ltd., Pro-Staffers LLC will replace the same category candidate with no additional charges, but “X” company (Bangladesh) Ltd. must claim the 90D-FRW within 90 days of hiring. After 90 days of hiring, 90D-FRW is not valid. After providing the right candidate to “X” company (Bangladesh) Ltd. and after final recruitment of the employee (finally selected by “X” company (Bangladesh) Ltd.) as permanent / regular employees, Pro-Staffers LLC will submit bill/ invoice for the service charges @ 1 month cost to the employee to “X” company (Bangladesh) Ltd. The payment must be cleared by “X” company (Bangladesh) Ltd. to Pro-Staffers LLC within 7 (Seven) days from the date of joining of the candidate / employee by “X” company (Bangladesh) Ltd.
After providing the right candidate to “X” company (Bangladesh) Ltd. and after final recruitment of the employee (finally selected by “X” company (Bangladesh) Ltd.), the employee(s) will be under the payroll of Pro-Staffers LLC during the probationary period. Pro-Staffers LLC and “X” company (Bangladesh) Ltd. will mutually negotiate/ settle down a monthly salary rate for the selected employee(s). Pro-Staffers LLC will submit invoice for the negotiated amount each month to “X” company (Bangladesh) Ltd. and pay the employee(s) salary that are under Pro-Staffers LLC’s payroll during the probationary period. “X” company (Bangladesh) Ltd. will not disclose the monthly amount settled for the employee(s) as a check and balance and mutual trust between the two parties. Pro-Staffers LLC will disburse the monthly salary to the said employee(s) during the probation period. During the probation period if the candidate is terminated then “X” company (Bangladesh) Ltd., shall not have to pay the 1-month cost of the employee as a service charge to Pro-Staffers. In an unlikely event, when a candidate leaves “X” company (Bangladesh) Ltd. within probation period, then Pro-Staffers LLC will find a replacement immediately. But “X” company (Bangladesh) Ltd. will be obligated to pay. After satisfactory completion of the probationary period, the employee(s) will be transitioned to the payroll of “X” company (Bangladesh) Ltd. and Pro-Staffers LLC will get 1-month cost of the employee(s) from “X” company (Bangladesh) Ltd. as the service charge(s). The monthly sales commission and/ or other benefits (OT, Mobile phone ceiling, pick & drop where applicable) allowed by “X” company (Bangladesh) Ltd. to the selected employee (s) will be distributed through Pro-Staffers LLC during probation period. Pro-Staffers LLC will submit bill/ invoice for the service charges of 1-month cost of the employee to “X” company (Bangladesh) Ltd. The payment must be cleared by “X” company (Bangladesh) Ltd. to Pro-Staffers LLC within 7(Seven) calendar days from the date of receiving the bill by “X” company (Bangladesh) Ltd.
After providing the right candidate to “X” company (Bangladesh) Ltd. and after final recruitment of the employee (finally selected by “X” company (Bangladesh) Ltd..) as contractual employees, Pro-Staffers LLC will submit bill/ invoice for the service charges. The contractual employees will work in “X” company (Bangladesh) Ltd., under Pro-Staffers LLC’s payroll and will be billed weekly or bi-weekly to “X” company (Bangladesh) Ltd. on the basis of negotiated hourly rate unless otherwise agreed upon. The payment for service charges must be made in favor of Pro-Staffers LLC through crossed cheque, or pay order, but no cash payments to any employee of Pro Staffers LLC is allowed. We prefer bi-weekly payment for contractual employee. In case of contractual employees are found involved in any fraud or money embezzlement event, this sort of an unlikely event, if such incidents happen, Pro-Staffers will take the liability and start taking actions against the fraud employee through standard legal procedures, FIR, Thana dealing, police investigation, press photo, criminal case filing, court handling etc., complying with the law of the land and ensure appropriate and justifiable punishment to the fraud employee if found guilty. “X” company (Bangladesh) Ltd. do not need to pay extra 1 month salary during probation period for any contractual employee, but the proportionate amount must be paid @ pro-rata basis up-to-the date the said employee(s) served/worked in “X” company (Bangladesh) Ltd..
“X” company (Bangladesh) Ltd. will allow a representative from Pro-Staffers LLC to be present as a silent observer in the Interview Board for the candidate(s) supplied by Pro-Staffers LLC. The representative from Pro-Staffers LLC will only watch the candidate’s weakness if any, for better profiling purpose for sending the next panel of candidate(s) to “X” company (Bangladesh) Ltd., if required. If Cemex Cement (Bangladesh) Ltd. allows us, so that Pro-Staffers LLC can be more specific about the core need of the requisition. Any candidates provided by Pro-Staffers LLC hereby authorize Pro-Staffers LLC to negotiate/ settle compensation and benefits package with “X” company (Bangladesh) Ltd. on behalf of them. Simultaneously, “X” company (Bangladesh) Ltd. may also authorize Pro-Staffers LLC to negotiate / settle the compensation and benefits package for the finally selected candidates. “X” company (Bangladesh) Ltd. will provide the maximum range of compensation and benefits package that “X” company (Bangladesh) Ltd. willing to offer for a specific position and the Pro-Staffers LLC will find the right candidate for the right post and negotiate the offered rate with the candidate(s) and make an amicable settlement with “X” company (Bangladesh) Ltd. in a win-win approach, so that all the parties involved “X” company (Bangladesh) Ltd., Candidate(s), Pro-Staffers LLC), will be eventually mutually benefited. Helps the individuals in making better decisions and effective problem solving. Provides a good climate for learning growth and coordination and so on. Builds cohesiveness in groups etc. Helps keep costs in many areas e.g. production, personnel, administration etc. Makes the organization a better piece to work and live and so on. Aids in developing leadership skill, motivation loyalty, better attitudes and other aspects that successful workers and managers usually display. Develops a sense of responsibility to the organization for being competent and knowledgeable. Provides information for improving leadership knowledge, communication skills and attitudes. Managing Effective Marketing Strategies: Pro-staffers LLC provides this type of training to the employees of the clients’ organization to take correct strategies to be the market leader. This training helps the organization to collect the current information from the market and side by side it helps to respond the situation. It helps the organization to analyze the competitor’s strategies and also help them to take corrective and the best actions. It helps the organization to face perfectly the globalization effects, demographical effects and also technological effects. Helps a person develops speaking and listening skills; also writing skills when exercises are required. Develops a sense of growth in learning etc. Through training and development motivational variables of recognition, achievement, growth, responsibility and advancement are internationalized and operationalized. Provides trainees an avenue for growth and a say in his or her future. Helps eliminate fear in attempting new tasks. Aids in orientation for new employees and those taking new jobs through transfer or promotion and so on. Pro-Staffers LLC’s recruiting plan is so diverse; its candidates come from all occupational backgrounds, and all skill levels. It has candidates that have little work experience and education and candidates that have years of work experience and Master’s Degrees even PhDs! It will only send to the clients’ candidates that meet them requirements and expectations. Here one thing needs to mention that pro-staffers stand to provide all level of employees as the clients’ requirement. Pro-Staffers LLC is a dedicated team of professionals that specializes in helping the clients find the candidates that are right for them personalized, caring service is its #1 priority. Staffing is the core business of this organization. So it always tries to send the best candidates for the right position of the clients’ organization. It takes the time to learn about clients’ industry and gain insight into how they run their business. To maintain its goodwill pro-staffers try to know the pattern of activities of its clients. So that it helps to find out the suitable candidates for the clients’ organization. It is locally owned and operated and takes great pride in its excellent reputation and commitment to its community. Pro-Staffer LLC can provide a full spectrum of solutions to the clients HR issues and concerns, and have an extensive network of partnerships to meet their needs as well. It goes above and beyond “filling a job order” for its partners. Its solution options are client-driven and are cost-effective. From salary surveys to retention analyses, interviewing tips to safety regulations, employment law to best practices – we’re here to help you be successful! Pro-Staffers LLC keeps a large resume bank and continuously tracks every possibilities/opportunities for potential placements for the right candidate at the right job. It informs the candidate by email/phone/fax, when it finds a right opportunity for the candidate. This is its core business and it strives for it. Pro-Staffers LLC is a staffing house offering a range of services in the fields of Human Resources and Management. Its operations concentrate on guidance to the corporate world as it exists and develops in Bangladesh. Over the two and half years, Pro-Staffers LLC has assisted its wide-range of clientele of corporate and development sector to meet their ever-changing demands in its human resources development and management. The firm offers customized services with care to its valued clients through a group of qualified professionals. These people, who combine the experience and judgment of seasoned professionals with requisite insights and skills, are fully competent to meet the clients’ requirements in specific areas. Today’s world is more competitive than ever before. Never before has the world of work has been so challenging. Never before has it been so imperative for the organizations and managers to learn the skills of management. The objective of the firm is to help organizations gain competitive advantage through enhancing the performance of their people. It provides staffing services of diverse nature and practical advice to its clients who need to achieve results fast. Hiring and developing quality human resource for the emerging private sector and fast changing corporate market is its multifarious activities. It ensures quality, reliability, efficiency and confidentiality while providing the services. Pro-Staffers LLC has been working in this country for two and half years but still it is not well known to the mass level people. The job seekers as well as the organization do not know it very well. So I think Pro-Staffers should take some steps to know the people that they are in the field to provide staffing services. For this it can arrange some seminars about Human Related Issues, put advertisement in the printing media and also at different job related web site. Pro-Staffers LLC still does not publish any annual report of it. So people are not alarmed about its success, its strength, its strategies and overall its activities. So I think it can publish Annual Report. Generally Pro-Staffers reaches agreements with its clients as well as the job applicants who are invited for having interview. Here I found that not only the candidates but also the clients sometimes feel fear to sign the agreement paper. So Pro-Staffers should make clear all the terms and conditions of the agreement to the job applicants and the clients. Sometimes it is founded that the job applicants do not come to the interview board. Then Pro-Staffers LLC faces a lot of problems. So I think it should be very much careful for inviting the candidates. For any organization employee turn-over is very much crucial thing. In Pro-Staffers LLC employee turn-over is moderately high. So I think it should take some important initiatives to retain its current employees. Employee satisfaction is also another important thing. The employees of the Pro-Staffers LLC are not as satisfied as the expectation. As a result here employee turn-over is high. As Pro-Staffers LLC is a staffing organization its employees always look for better organization where they get more money and recognition.